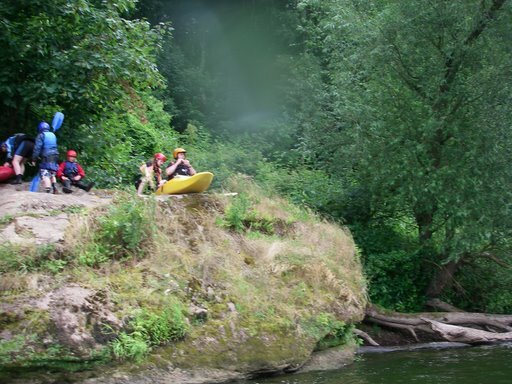 On Sunday 5th July, six Isis members travelled to the River Wye for some fun on the water. Graham, Anthony, Dave, Helen, Glynn and Jen arrived nice and early at the put in near Lydbrook and took advantage of the empty car park to unload our boats and get ready, but within half an hour the entire place was heaving with other paddlers eager to get on the water both in kayaks and open canoes, including Kingfisher Canoe Club, South Avon Canoe Club and some scout packs. 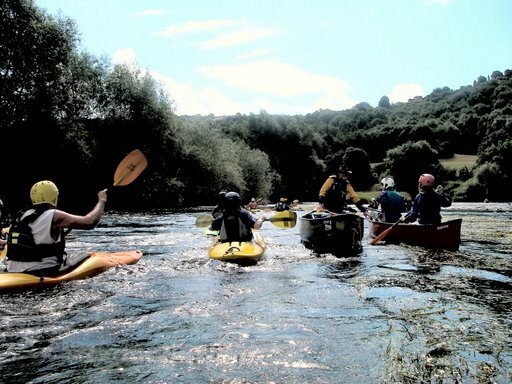 We managed to squeeze into the queue to get down to the river and launched into the shallows before moving out to deeper water. We started by paddling upstream, being careful not to get caught in the flowering weeds, and then practiced edging into and out of the flow. We watched as lines of open canoes made their way down the river in the glorious sunshine. A little further down we played in some of the eddies, breaking in and out, practising how to use edging to ease our way into the flow. Dave found it easier to name his knees, Jenny and Susan, a novel way to remember which one to use to help edge the boat! Graham and Anthony did a fantastic job of making some nice clean break outs into the flow. We continued on down the river past ducks and swans and even some birds of prey circling in the sky. The sun was lovely and warm and the water was like a cool bath. We stopped at Alcatraz for lunch, a rock sitting in the river surrounded by water. Glynn was first out of his boat; he clambered up and hauled his boats up onto the top of rock, followed by Dave, Anthony, Graham, myself and Helen. We sat and posed for some photos and then sat on the edge of the rock, dangling our feet over the water and had a well earned rest with some lunch. 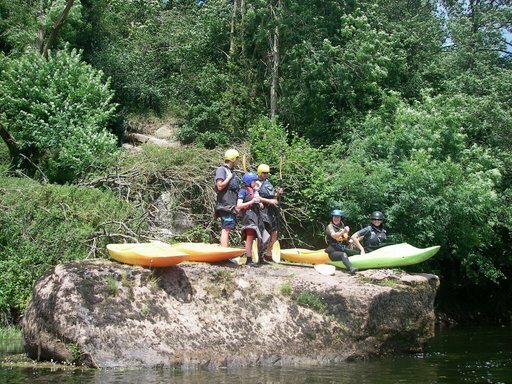 Lots of kayakers and canoeists paddled past wondering how we had managed to haul all our kit onto the top of the rock, but it was fantastic to see so many smiling faces enjoying the rivers, views and sunshine. Once on top of Alcatraz there is no escape...bar a seal launch down into the river below, so once we had finished our food we all jumped back into our boats and one by one we all successfully launched back into the Wye. We continued on down the river and our next big stopping point was seal launch rock, a popular place for everyone to make a dramatic entry onto the water. Glynn, Helen and I all clambered up the sloping rock face to join other fellow launchers being cheered on by groups of eager kayakers below. One by one we all slid into the river, on a higher than usual launch because the river was lower than normal. By far, the most impressive launch was Glynn's as he completely disappeared from view under the water, emerging seconds later with a big smiling face. 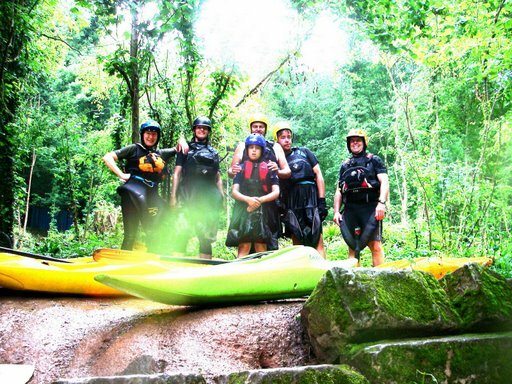 We eventually came to Symonds Yat Rapids, and while the water was lower than usual, there was still enough flow to create a fun wave train and practice reading the water. Graham, Anthony and Dave had two fantastic descents down the rapids, choosing their line and paddling with intent to break out just as the rains came down. Luckily it didn't last long and we made our way to the get out and well earned drink and ice cream while we waited for the shuttle. A fantastic day with great achievements all round, well done everyone! See more of Glynn's photos here.